More Bible Pictures Than Ever! 16,000 Royalty Free images in 450 folders on 2 DVDs! 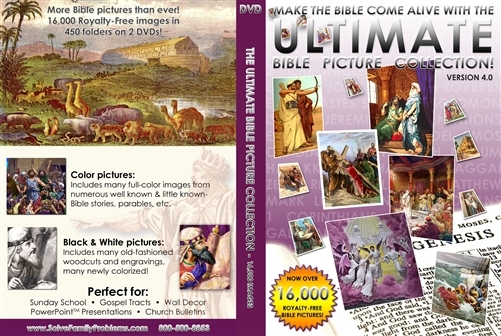 Color Pictures: Includes many full color images from numerous well-known and little known Bible stories, parables, etc. Black and White Pictures: Includes many old-fashioned woodcuts and engravings, many newly colorized! Perfect for Sunday School - Gospel Tracts - Wall Decor - PowerPoint Presentations - Church Bulletins - Promotional Events and so much more. IMPORTANT TERMS OF AGREEMENT NOTE: "By purchasing this product I agree that I will only use the pictures on these disks for my personal use or for use in my local church and I WILL NOT use the pictures to publish any type of material or books or tracts or curriculum or videos that will be sold by anyone for any reason. I understand that if I wish to purchase pictures that can be used for publishing that I can contact: administrator@solvefamilyproblems.org to purchase individual high resolution pictures for $25 apiece." Many other pictures are available for purchase for publishing which are not available on this set. Write and tell us what Bible or Victorian picture you want and we will try to provide it.